The Department for Youth Services aims to support all of the youth activities within the Diocese. The Diocesan Youth Service based at The Emmaus Village is the Youth Ministry Team (external website). 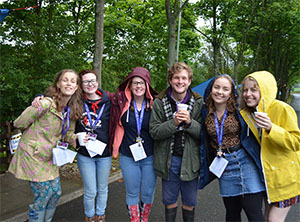 YMT offers missions, festivals, outreach events and retreats enabling individual parishes and partnerships to offer young people opportunities which they otherwise could not provide. YMT along with other members of the Youth Service Forum encourage young people in our Diocese to take part in local, national and international events. These opportunities help our young people grow and develop in their faith and contribute to the life of the Church. Everyone has a role in this ministry of accompanying and supporting our young Church, the members of YMT and our Youth Service Forum are available to help, support and encourage all those working with young people in the Diocese of Hexham and Newcastle. Please get in touch!